At the Osa Conservation Biological Station, mornings in the rainforest are full of sound—birds, frogs, insects, and monkeys all chirping, singing, buzzing and howling in a unique concert. But not far away, where staff and volunteers are working to restore and rewild deforested pasture lands, the dawn chorus strikes a different tune. Many of the low whistles, creaks, and croaks of the forest are being replaced by new, often higher-pitched sounds. 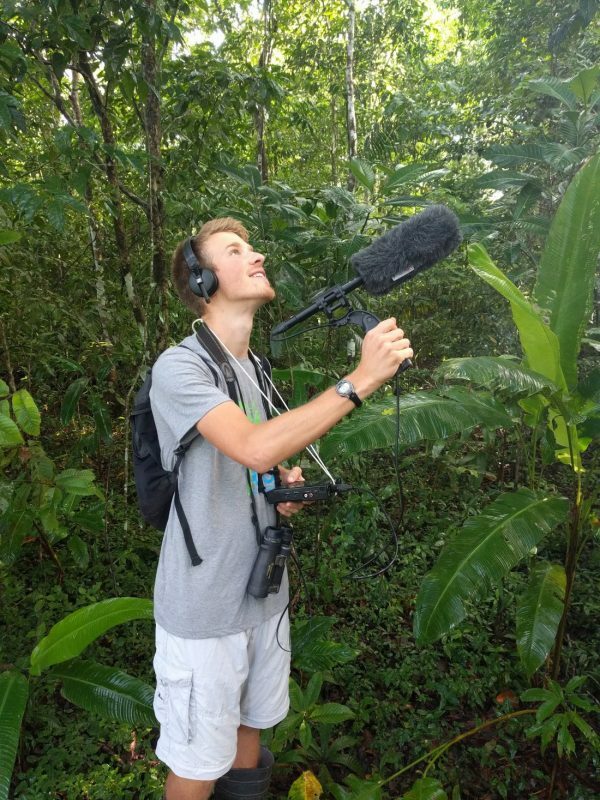 As a researcher and intern with Osa Conservation, I’m studying how changes in forest structure (both deforestation and regeneration) are affecting animal sounds, focusing particularly on bird acoustic communication. Birds play important roles in forest regeneration by pollinating flowers and dispersing seeds, helping rainforest plants to colonize disturbed areas. At the Biological Station, the White-necked Jacobin (left) is a key pollinator, and the Scarlet Macaw is an important seed disperser. Birds have key roles in pollinating and dispersing the seeds of rainforest trees, and so are an especially important group for understanding the effects of forest loss and promoting forest recovery. Deforestation can alter bird communities in surprising ways. My research tests a theory called the “acoustic adaptation hypothesis,” which proposes that birds evolve their songs with characteristics that help them travel most efficiently through particular habitats. Because low pitches, which have longer wavelengths, can bend more easily around obstructions like trees, bird species adapted to forest loss may sing higher pitches in open pastureland than birds living in intact forests. Birds of intact forests tend to have lower-pitched vocalizations with a narrower range of pitches, which can transmit better through forest understory vegetation. 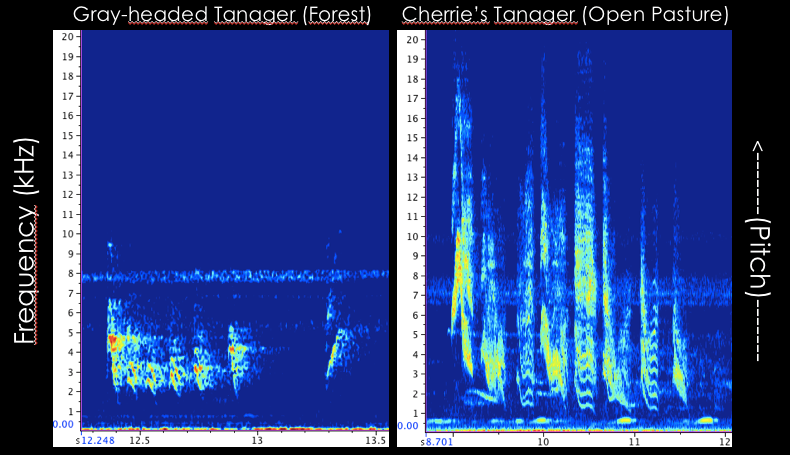 Here we can see this exemplified in the spectrograms (song pictures) of two species of tanagers common on the Osa. The Gray-headed Tanager, a forest understory species, has lower-pitched calls than the Cherrie’s Tanager, a species adapted to open habitats and edge. To test this, I will head out into the beautiful primary forest to record the wide variety of birds that live there. I will be comparing their vocalizations with those of the birds living in the neighboring grasslands, where Osa Conservation is planting trees to restore these abandoned pasturelands. This research will help show how birds may adapt acoustically to changes in habitat, examining one way in which humans are impacting the sounds of the forest. Recording natural sounds and studying bird bioacoustics offers an exciting new way to assess wildlife populations for conservation on the global biodiversity hotspot, the Osa Peninsula.